Artist impression of Is-Suq when it reopens its doors. Works on the rehabilitation of the iconic Victorian-era structure, affectionately known as is-Suq tal-Belt, are in full swing to have the project ready by the end of next year. Arkadia Group was granted a 65-year lease of the property by Parliament’s unanimous approval last January 13 to restore the neglected place, a key structure in Valletta’s historical buildings and return it to its original concept: that of selling and celebrating food. The project will entail an investment of €10 million. The concept underpinning Arkadia’s project for the scheduled Grade 1 building is ‘Cook. Eat. Relax’. The basement level will serve as a food market, with fresh food outlets such as a butcher, a fishmonger, a delicatessen counter, a bakery and among others, a section for fruit, vegetables, herbs, spices, oils and wines. The ground floor will be dedicated to several stalls preparing culinary specialities for immediate consumption, like a meat and fish grill, traditional Maltese food, pizzeria, a vegan and vegetarian eatery, paninoteca and salad bar, among others. The upper level will be transformed into an open space where visitors can wind down and socialise. This level will also serve as an ideal venue for cultural initiatives such as exhibitions, discussions and live bands, in the spirit of the operators’ commitment to collaborate with the Malta Arts Council and the Valletta 2018 Foundation to support the local cultural scene. The rehabilitation works on the mid-19th century building are entrusted to a team of Maltese and Italian architects and engineers, who are working together on different aspects of the project to bring back to life the Maltese collective memory of the Valletta market as it has always been known,with its colours and flavours of fresh produce and variety of food products. Italian architectural design firm Archea, of world-renowned architect Marco Casamonti and partners Giovanni Pollazzi and Laura Andreini, was chosen following an international call for the holistic design of the project. Archea is based in Florence with offices in Milan, Rome, Dubai, Beijing and São Paolo. They were responsible for the renovation project of the Mercato Centrale di San Lorenzo in Florence. Other projects worth mentioning are the Antinori Winery, the Birra Peroni Headquarters, the Beijing Jun Zhuang International Winery Culture Centre and the Liling Ceramic Museum. 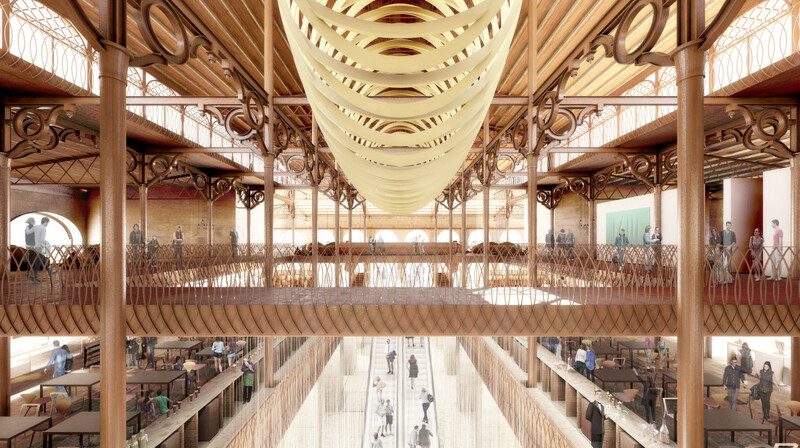 The Maltese firm CGE Architects, led by architects Philip Micallef and Joe Cassar, has been entrusted with the execution of the project, while architects Hermann Bonnici and Jean Frendo are the team’s restoration consultants. The mechanical and electrical engineering has been entrusted to the firm Camilleri & Cuschieri, led by engineers Carmel Cuschieri and Jonathan Bonnet. The two teams are working very closely with the Superintendence for Cultural Heritage to ensure all plans are in line with the watchdog’s requirements. There will be a workforce of around 90 people employed in the management and the implementation of the works. Once opened, is-Suq tal-Belt will employ over 140 employees, partly employed by Arkadia Group and others by the tenants. In selecting the new tenants, Arkadia will be exploiting its 15 years of experience in the food outlets business and the high standards it has become renowned for, to identify the best brands for the project’s different concessions, both for the fresh produce market and the catering establishments. Works on the rehabilitation of the building are expected to be concluded by the end of 2017 and once inaugurated, is-Suq tal-Belt will be open seven days a week.